Hi there, it’s Melissa from The Sweet Escape here with a recipe that will leave you feeling warm and cozy all over — literally. Fall always brings out the urge to get cozy in the kitchen and turning to our favorite comfort foods while the weather outside starts to get a bit more chilly. 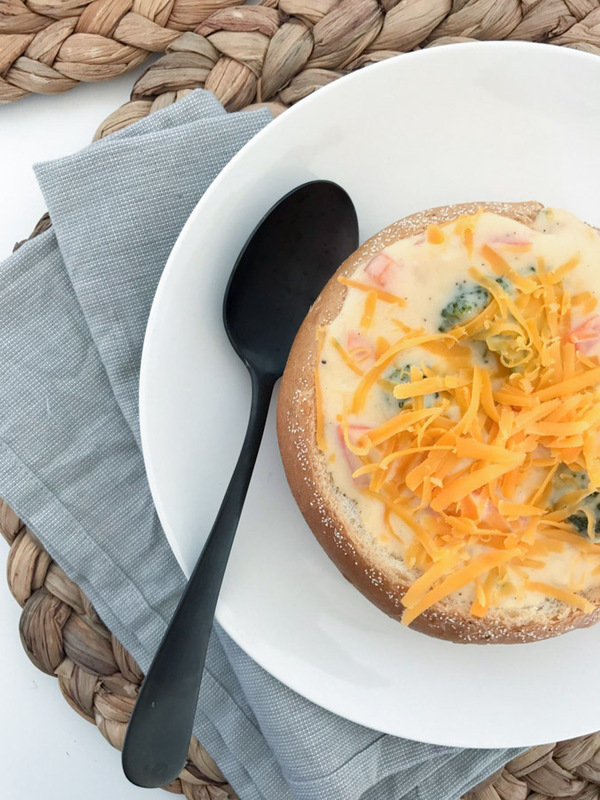 This vegetable cheddar soup bread bowl recipe will leave you eating every last drop and crumb — even the bowl! You may have ordered something similar to these bread soup bowls at one of your favorite restaurants thinking they were pretty fancy, but guess what? You can make them at home easily and impress your guests with your chef-status skills. 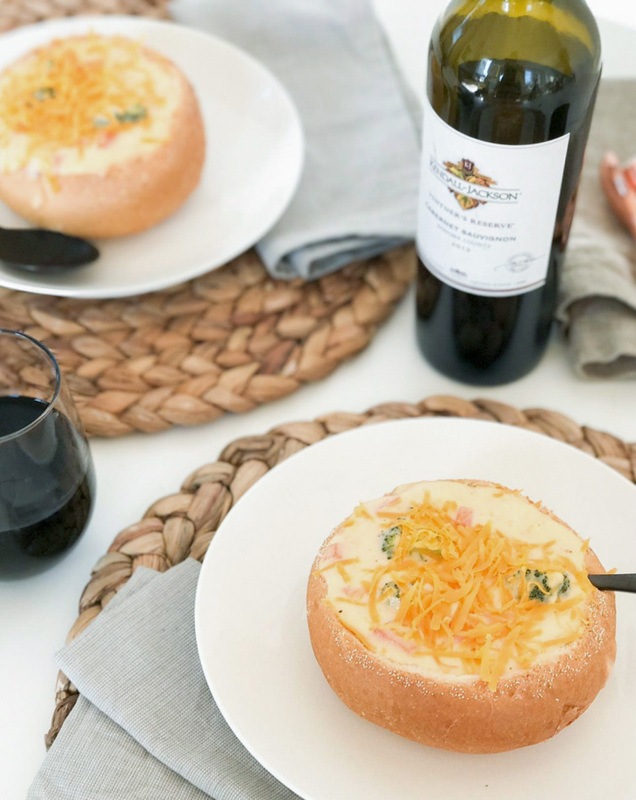 This vegetable cheddar soup is full of your favorite hearty vegetables swimming in a flavorful creamy cheddar broth, hugged by a soft bread bowl. Serve with Kendall-Jackson Vintner’s Reserve Cabernet Sauvignon to enhance the goodness. Is there anything better to warm you up on a brisk fall day? This is a one pot recipe and because you eat the bowls, you literally have only one pot to wash when you’re done! Of course if you’re strapped for time, forgot to pick up the bread or on a bread-free diet, you can serve this soup in any bowl your heart desires and it will be just as delicious. See below for the full recipe or check out this video we put together to see how these bowls of warm goodness come together. Slowly add the half and half cream and chicken stock. Add the nutmeg and bay leaves and cook on medium low until thickened. Add the carrot and broccoli and simmer until tender. 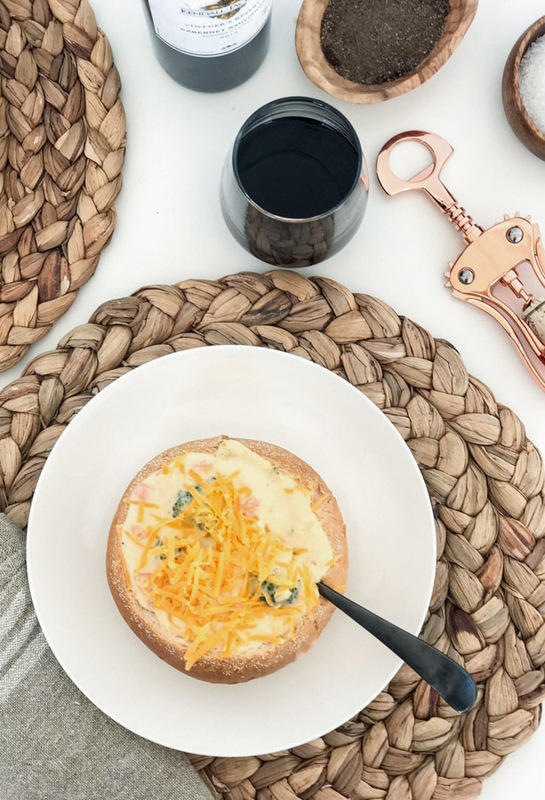 Serve hot in bread bowls, pour a nice glass of Kendall-Jackson Vintner's Reserve Cabernet Sauvignon and enjoy!